Surrey – The City of Surrey announced the release of this year’s Party for the Planet performance schedule and site map, which are now available for download at surrey.ca/partyfortheplanet. The free event, which is B.C.’s largest Earth Day celebration, will feature the new undercover Live Green World, the popular Adventure Zone and over 70 environmentally friendly exhibitors and vendors. All events are Saturday April 13 from 10AM to 6PM. 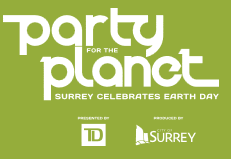 Be the first to comment on "Surrey 2019 Party for the Planet Schedule – Saturday April 13"